When you are facing a difficult issue like criminal charges, debt problems or divorce, it seems like everyone has an opinion, and they're likely to be negative. In times like these, you don't need judgment. Instead, you need experienced legal help from a supportive attorney. That's what you'll find when you hire Feeman Law Offices. With an office Lebanon, we serve clients throughout central Pennsylvania in matters of criminal defense, bankruptcy and family law. Our law firm offers practical advice, honest answers and realistic assessments meant to help you resolve your legal issues in the most favorable manner available. No matter what criminal charges you may be facing, we can likely help you. Criminal defense lawyer Scot Feeman is a former prosecutor, which allows him to see criminal cases from all sides. From minor traffic offenses to serious felonies, our criminal defense firm is here for you. If you are facing serious debt, we offer non-judgmental representation and legal advice in matters of personal bankruptcy. We want to help you discharge or restructure your debt while protecting the assets that matter most to you and your family. Finally, Feeman Law Offices represents individuals facing divorce, child custody disputes and other family law issues. We work toward a fair, efficient resolution of your case that protects your financial future and your relationship with your children. 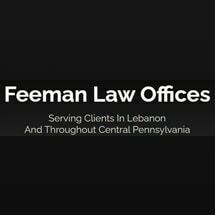 To learn more about what Feeman Law Offices can do for you, contact us for a free, initial consultation.